It wasn’t all that long ago that Ronda Rousey was vying for the title of the biggest draw in all of mixed martial arts alongside Irish superstar Conor McGregor. Unfortunately, Rousey’s rise and fall in the UFC came rather quickly over the course of just three years where she was once the most dominant women’s athlete on the planet to a pair of back-to-back losses that effectively ended her fighting career. Just recently, Rousey inked a multi-year deal to become part of World Wrestling Entertainment (WWE) and she made her in ring debut at WrestleMania 34 to rave reviews. The former Olympic judoka ended up as one of the best highlights of the entire show that is considered the biggest stage in WWE during any given year. While it’s impossible to gauge where Rousey will go from here in her WWE career, UFC light heavyweight champion Daniel Cormier believes she can become an even bigger star than anything she experienced during her tenure in mixed martial arts. “The UFC we do have viewers but every Monday 3 million people watch WWE “Monday Night Raw”,” Cormier said on “UFC Tonight”. “She competed in front of 85,000 [people]. She didn’t do that in the Olympics, she didn’t do that in the UFC. It’s a bigger platform. I think she’s going to blow up even more. Cormier definitely has merit in his argument considering the biggest superstars in professional wrestling such as Hulk Hogan, “Stone Cold” Steve Austin, Dwayne “The Rock” Johnson and John Cena have become household names through professional wrestling. That list is much smaller in mixed martial arts, although Rousey and McGregor probably sit atop that list as the best known names in the history of the sport. 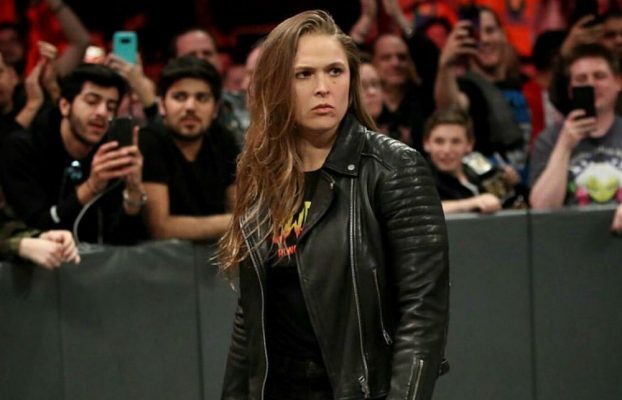 Only time will tell on how far Rousey can go in her WWE career but she’s definitely off to a good start with her debut at WrestleMania 34 this past weekend.